The painting on the left is by Varun's favorite surrealist artist René Magritte. The painting is titled The Treachery Of Images (La trahison des images). 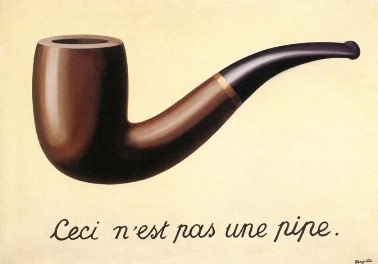 What struck me in the painting was the words on the painting, which when translated mean - "This is not a pipe." Look at it in a surrealist way, and you'll realize that the pipe in the painting is not real. The image just betrayed you! The first thing that hit my head as an analogy was the whole blogosphere. People blog, become famous, attend blog conferences, make blog b-cards, and what not! And we all have an image of that favorite blogger of ours. But does it truly characterize that person? Well, the blog just betrayed you, mate! Don't believe me (in this blog)! Just finished writing my last examination in BITS. I'll never miss writing one, though! Usually when u search too hard for something, you wont find it; yet when you re not looking for it, it presents itself right before your eyes!